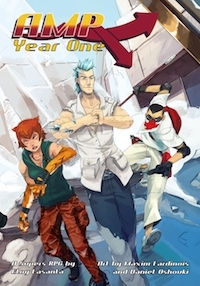 Year One is a core rulebook for the AMP roleplaying game, written by Eloy Lasanta and published by Third Eye Games. AMP stands for people with Accelerated Mutant Potential. The year is 2015 and there is an emerging group of people exhibiting strange powers. These powers stem from experimentation that started in the 1930s. The strange powers that are being exhibited are akin to super powers and with all great things, someone wants to control them. As these individual powers are discovered across the world, several government agencies have stepped out of the shadows to regulate the use of these powers. Adding to all of this, each AMP has a chemical need to attack other AMPS who are in close proximity. They can overcome this, but the urge to fight one-another and the hunt by government agencies makes super powers feel not-so-super. On the outside, AMP: Year One looks exactly as it should; the combination of colors and art style with a coming at you perspective amp up the energetic feeling that this game has. This game, from a mechanical standpoint, is designed to tell a story; the folks over at Third Eye Games are good at that and they have designed games in the past that attempt to and often transcend your typical hack and slash RPG. At its essence this is a super heroes game and the influences listed at the end of the game affirm that. I was happy that it wasn’t designed to be a silver or golden age heroes type game, but went more along with the Heroes Television series. The addition of the “programmed need for AMPs to clash” was another nugget of goodness that really adds a unique dimension to this game. The first chapter predictably gives a history of Project Black, the super secret joint international government project that developed the serums that created the AMP bloodlines in the 1920s. There is a time lapse and the current information includes a series of events that occur when the decedents of Project Black start to manifest their powers. Because this is year one, many people are unaware of their own powers or the powers that AMPs are displaying. All the while the government is trying to cover up and hunt down the AMPs before things get out of control. I think this was a good choice as it allows the players to be on the ground floor and supplements to the game can easily be introduced as year two and so forth. Each year could introduce new major events as well as rules tweaks based on the activities presented in the game timeline. Next comes the character creation and this is another area where Third Eye games tends to do a good job, AMP is no exception. Like many companies, we start to learn the rules as we create characters. I like this approach as it makes the first time I read the rules section of a book feel like a review rather than something completely new and foreign. I appreciated the warm up that is provided by requiring a character concept followed by loyalties and affiliation. These are good because it forces the player to have a really good idea of what type of character they are going to play before they choose their skills and peruse the over fifty powers available to them. I found that power choice was the most difficult phase of character creation for my players and me. There are so many great powers and a few of them don’t show up exactly where you might expect them to, so getting players to read through all of them was a time sink that required some pre-reading. In a few cases, I actually took the players concept and married it up with the powers in the game that supported it to save time. This had the added benefit of the players not knowing what powers their adversaries might have. If during the game one of my players felt like they witnessed a power that was better suited to their concept, I let them switch it, no big deal. Third Eye Games was kind enough to include a quick creation guide not only in the rule book but on the character sheet as well. This system includes special gifts and drawbacks which not only make a character feel original, it provides mechanics that help create conflict. The next chapter was the “spell book” section of this book; only, replace spells with powers and wa-la, you have super heroes, or at least people with super powers, they are not all heroes. Each power has a sort of power tree, like the ones you might find in popular MMORPGs. The powers are broken down into nine different strains and each hero can have three powers, so no character is really a one trick pony. Heroes must have their primary power originate from their strain, but can pick powers from other strains as their secondary and tertiary powers; this adds to that oh so fresh feeling and gives players a chance to play around a bit. The characters can’t just use their powers whenever they want; they need juice or mana if you are stuck on the whole MMORPG thing. This is basically adrenaline, and on top of their base juice things that cause adrenal spikes give a character more juice. Following the powers chapter is the rules chapter. This system takes some getting accustomed to; it isn’t that the system is so complicated, it just requires less dice and more skill combinations than most D20 gamers might be accustomed to. This chapter caused me the biggest growing pains (as all rules chapters tend to do). Once you use the system, it makes sense, but by this point in the book the amount of examples had fallen off dramatically and while numerically the addition of numbers on a one skill check made sense, they got in the way during game play. This isn’t Third Eye Games first rodeo, but I wish there had been a work around on this. Minus that and a few other calculations that seemed cumbersome, especially during tense combat, the system works for the spirit of the game. The final chapter is for people running the game. It gives storytelling tips and talks about how the setting should feel. This chapter asks the important question of what would you do if you woke up with these powers? Third Eye Games once again showed that they are all about the gaming experience. Most of the advice falls back on the rule of cool and reminds the people running the game that games are made to have fun. This is a super heroes game that for the most part feels right. There are a few things I’d tweak, but if you are looking for a game that allows to become the super powered person you always wanted to be, the person with the powers you read about in the comics, then this is the game for you. The overhead of dice and rule books is small and with a D20, pencil, and rulebook, you are ready to go. I had a great time playing this with my group and I think you will as well.